DESPITE the benefits of technology’s unrelenting impact on modern life, there are some areas where tried and tested products still more than hold their own. 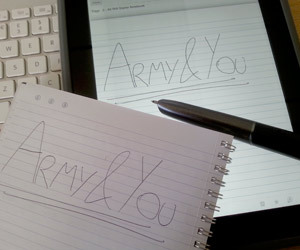 For the editorial team here at Army&You, a perfect example is the humble combination of pen and paper. Whether we’re planning the next issue or taking notes during an interview, our notebooks are scribbled in on an almost daily basis. We were convinced that our favoured tools of the trade would continue to hold their own in the digital age, but almost inevitably a hi-tech upgrade to our chosen method has arrived on the scene in the form of the Livescribe wifi smartpen. Targeted at those who love the permanence of pen-and-paper but also appreciate the benefits of the digital world, Livescribe’s system allows users to make notes and record audio then effortlessly upload them to be stored and accessed securely online. 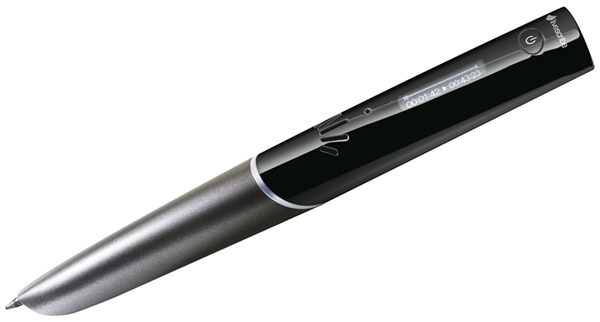 The first thing that stands out about Livescribe’s smartpen is its size. For anyone used to writing using a regular-sized implement, the chunky digital equivalent will initially feel oversized. The pen itself contains a replaceable ink nib, a built-in video camera to record notes and actions and a clear display screen housed in the upper part of the shaft. The storage on our version was 4GB, enough for a huge amount of audio and text to be saved should you be away from wifi access. Also included in the box are a replacement nib and a couple of caps as well as stickers helping you to do everything from setting up the wifi to sharing notes on social networks with a few touches of the pen. The pack contains a notebook filled with specially-dotted paper which allows the pen to track your notes much more easily, providing clear and legible reproductions online. Given the fact that you only have a tiny screen to guide you, set-up for the Livescribe is remarkably easy. A special page in the notebook guides you through four easy steps to scan for, find and select your network and then connect wirelessly. Once that is done – and you have registered for a free Evernote account – you are ready to go. Our pen did require a firmware update, but that was done automatically and took no more than a few minutes. With our pen registered, we set about testing it. The bottom of each page of the notebook has a printed set of “controls”, including record, pause and stop icons. All we had to do was tap the nib on record and the pen started recording. After scrawling a few shorthand notes on the page and saying each word aloud as we went, we tapped the stop icon and the pen automatically began to sync our work with Evernote. A quick refresh of the latter’s application and our notes appeared on the computer screen having been sent wirelessly from the pen. Impressive stuff, but the real magic was that the Livescribe had also recorded audio as we were writing and our spoken words were available to hear with the click of a mouse. The system’s ability to scan and recognise your handwriting is fairly good and allows users to search for specific words or phrases within their notes, handy if you have several pages to scan. The ability to record sound as you write is a real benefit of the Livescribe. Whether you’re in a long meeting or taking notes during an interview, there are times when you don’t really want to write down every word that is said. Thanks to this device, you no longer have to. If someone is about to say something you think will be important, you can simply write one word or number on the paper and then let the pen pick up the slack by capturing everything that is said. Once the file is uploaded, all you have to do is click on your cue and listen to the playback. Although it weighs not much more than an equivalent biro, there is no denying that the Livescribe is a hefty piece of equipment. For anyone with large hands, this doesn’t pose any problems and we were able to make two pages of notes over about ten minutes without any discomfort. Whether the same can be said of those with smaller hands is a matter open for debate. Trying to convince pen-and-paper aficionados that their favoured equipment can be enhanced by technology is always going to be a hard task, but Livescribe have had a very good go at doing so. By retaining the tactile joy of physical writing, the wifi smartpen is in our minds a step ahead of alternative devices such as voice recorders. Using the system is quick and easy and the ability to have text and audio saved in one place will make a real difference to anyone who has to take copious amounts of notes, especially if they don’t know shorthand. And with devices ranging from smartphones to tablets now commonplace, the possibility of accessing your notes even when away from your desk is a key selling point. Starting at £159.99 and increasing to £179.99 for the 8GB model, the Livescribe wifi smartpen is not particularly cheap, but its versatility makes it a sound investment for everyone from managers to PAs – and even this team of old-school journalists. Available now. Visit the Livescribe website for more information. Not convinced! Surely its a solution to a problem that doesn’t exist?! 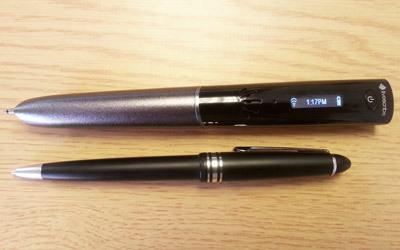 Use a pen for writing and dictaphone for recording audio. Simples.